So, after the fighting that resulted in cutting off the Cotentin Peninsula and capturing Cherbourg and its port, the 9th Infantry Division was moved south into “Bocage Country”. Here, battlefields consisted of small fields separated by hedgerows, solid three foot thick and three foot high earthen mounds. These banks were capped with hedges, brushes, trees and sometimes wire. The rain did not help. Tanks were snarled up along the roads. Each man was on his own and a gain of 300 yards a day was a good day’s work. The American Forces, including the Old Reliables, were attempting to push south to the pivot point of St. Lo, the big city. The move was a build-up that would send the Third Army out into Brittany and the First Army toward Falaise and beyond. On July 10th, 1944, VII Corps was on the offensive with the 4th, 9th and 83rd Infantry Divisions abreast. Crossing the Canal de Vire, the 9th Division moved on the Hommet Woods. Slowly but surely pushing on, it moved until it reached the St. Lo – Perriers Road by July 21st. A lot of action took place on the 25th of July, 1944. On this day all troops of the 47th Infantry Regiment were pulled back about 1200 yards north of the Periers – St. Lo road. They assembled in an area west of Ponte Ducrie, near the hamlets of La Cuillourie and Ponte Hairie. 1st Battalion held the area at the west, 2nd Battalion was in the middle, and the 1st Battalion on the east. Allied bombing started by medium bombers and the first raid went OK. However, by the time that the heavy bombers arrived, the south wind had blown the smoke designating the bomb line back onto the troops. As a result, the heavy bombers bombed their own men. Men of the 1st Battalion only suffered a few casualties. They were lucky, as one of the bombs dropped right in the middle of an aid station, but it proved to be a dud, and did not explode. 2nd Battalion also escaped with slight losses. The 3rd Battalion however suffered heavily. The Command Group of 30 men were all killed or wounded except for the Battalion commander and the Commander of K Company. Several other members of K Company and one platoon of M Company also suffered losses during the bombing. This all happened in the morning, around 0930 hours. Around 1100 hours, 2nd Battalion began to push forward and attacked an area near La Couperie. 1st Battalion fought near La Rillerie and went towards Marigny and the Periers – St Lo Road. 3rd Battalion took a bit longer to prepare, and fought their way via Montreuil. It sure was a though day for the 9th Infantry Division. Meanwhile, elements of the 4th Infantry Division on the 9th Division’s left entered St. Lo, opening the way out of Normandy. Hitler however, had other plans. He ordered 4 Panzer Divisions to strike westward toward Avranches on August 7th, 1944. To forestall the Germans, 1st Battalion of 39th Infantry Regiment was ordered to occupy the high grounds south-east of Cherence le Roussel and block all roads leading to Avranches. Then the enemy launched four reinforced companies against the Americans who countered them with bazookas, mortars and Artillery support. Roadblocks were established and the troops dug in for the night. At about 0300 hours that night, the enemy attacked again. This time the attack was supported by a Company of tanks. Brutal hand to hand fighting ensued. Hand grenades were hurled against tank tracks. Four times the Germans attacked with superior forces. Four times they were driven back with at least 10 of their tanks knocked out. The 39th Infantry Regiment, “The Falcons”, had made their own contribution to the ultimate destruction of Hitler’s Panzers. Then the Americans, British and Canadians had formed a pincer movement forcing the German 5th and 7th Armies into a salient between Falaise and Argentan. By August 14th, VII Corps had joined the Allied drive to close the gap. Attacking the “Falaise Gap” from the south, west of Argentan, the 9th Infantry Division, along with the 1st Infantry and 3rd Armored Division, squeezed the Germans. Steadily, the “Old Reliables” swept the north to the Briouze – Argentan Road. By nightfall on August 17th, 1944, they had reached the highway aided by the 746th Tank Battalion. Reconnaissance patrols contacted the British at 0948 hours the next morning. The gap was all but closed. Though most of the German armor managed to escape, 50,000 prisoners were taken. While the men of the 9th Infantry Division enjoyed a short rest in reserve, there was a change in Command. General Manton S. Eddy was promoted to commander of XII Corps, Third Army. Major General Louis A. Craig succeeded him as commander of the 9th Infantry Division. The Ninth Division crossed the Seine River on August 27th, 1944. Resistance was scattered. The 47th Infantry Regiment cleaned out a rear guard in the woods north of Evry Les Chateau, taking 233 prisoners on the way to Marne. Infantry men rode the tanks and tank destroyers, crossing the Marne to reach Chateau-Thierry and Belleau Woods on the 29th of August. Dizy-le-Gros was reached on the 31st of August. The 9th Division had advanced 403 miles since August 1st, 1944! 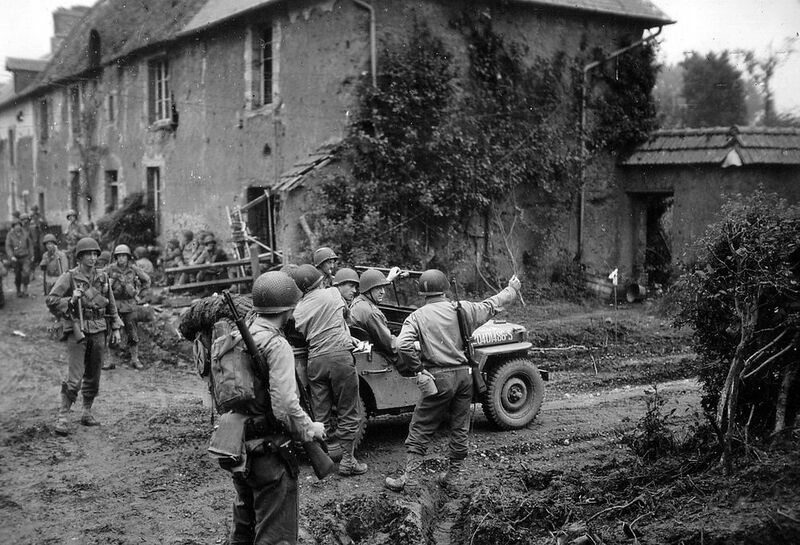 The Liberation of Belgium began at 1107 hours on September 2nd, 1944, when members of the 9th Reconnaissance Troops crossed the border in the heavily wooded area near Momignies and proceeded to push toward Charleroi. This marked the beginning of an 11 days campaign that crossed Belgium and carried the 9th Infantry Division into Germany. Its first major goal was to cross the Meuse River at the city of Dinant, a famed pleasure resort overlooked by a fortress, 1000 feet above the river. 2000 German Infantry men, 6 batteries of Artillery, tanks, self-propelled and Anti-Tank guns awaited the Americans. General Craig decided to cross at night, feinting an attack at the center while flanking Dinant to the north and south. Rubber boats and pontoon bridges were wrestled down steep banks to the river edge. Due to cross at midnight on September 5th, 1944, 1st Battalion 39th Infantry Regiment sent its initial wave at 3am. Twelve of the first fifteen assault craft were sunk. Twenty men and the commanding officer of Company A made it, but all were killed, captured or wounded. Fortunately the 3rd Battalion discovered a catwalk. GI’s began crossing early in the morning and by nightfall two Battalions were over, holding their bridgehead. North of Dinant, the 60th Infantry Regiment established a firm bridgehead, although it was achieved at the cost of 80 percent of losses for its 2nd Battalion. Enemy mortar and machine gun fire thwarted bridge-building attempts by the 15th Engineer Battalion. An aid station was set up on the bridgehead by the 3rd Battalion, 60th Infantry Medical Detachment. An enemy counter attack forced the medics to remove equipment and casualties. Finding no boat, one medic swam 100 yards across the river, brought over a boat, enabling the medics to evacuate over 30 casualties through shrapnel and a hail of bullets. During the 6th of September, the Old Reliables enlarged their footholds. That same evening, 3rd Armored Division’s Task Force “King” rumbled in. Weary GI’s boarded the tanks and cracked through enemy lines into Dinant. With the bridgeheads expanding, the Engineers were able to place a tread-way bridge over the Meuse River. The enemy began its withdrawal during the night of 6th to 7th of September. Along with the 3rd Armored Division and the 4th Cavalry Group the 9th Infantry Division began leap-frogging, getting rides on Armored vehicles heading for Germany and the Siegfried Line. 200 Germans were killed at Bois-et-Borsu when they got in the way of the fast moving troops. The 47th Infantry Regiment joined the 3rd Armored Division to liberate Liege, the capital city of French speaking Belgium on September 9th, 1944. The U.S. First Army , including VII Corps and the 9th Infantry Division were now approaching Germany!